Will this be able to make runs out to Port Canaveral? Do you think it is street legal? Seems to have similar characteristics to the KAMAG they have used in the past (self propelled at low speeds, lots of axles to spread the load) so it would be a little surprising if they weren't allowed to use it. Does anyone know if this vehicle can be towed at higher speeds like they did with the KAMAG? In fact, the axle loading with an empty falcon on it is probably quite low by commercial standards. I suspect a normal gravel or steel hauler is harder on the road surface. Empty weight is 70 t, plus 30 t for the Falcon and 10t for the steel frame, That's 11t per axle, over the weight limit for much of the US. Unless there's an exception for having 8 tires per axle. Towed? According to this it has a 335 HP air cooled V-12. The Kamag modular trailer can be fitted with a hydraulic power pack to make it self-propelled at low speeds, but it can also be towed by a standard tractor at highway speeds. The question was if that is possible for the Orbiter Transporter. My guess is it isn't, because that wasn't necessary for its original purpose, and it would require extra equipment. It has 19 axles (9 sets of 2-axle groups, and a single axle in the front). Its max gross weight is 367,000 lb, which (evenly distributed) is 9.6 tons per axle and 19.3 tons per 2-axle group. It would need to be permitted as overweight and oversize, but shouldn't be a problem on most roads. I wonder if anyone has insight into the history of these type of vehicles? I don't know of anyone besides KAMAG that is making vehicles like this. I am really wondering if this is another industrial opportunity missed by US company's after the technology was developed here? b. The Orbiter transporter was built by an Italian company not KAMAG. Think this video answers the question of road legal, self-propelled etc. Kamag and several others build special vehicles for the heavy haulage industry. Both for special transports over public roads, and for internal transports. Kamag and Scheuerle are German companies. Nicolas is (was) French, is now part of the same conglomerate as Kamag and Scheuerle. Cometto is Italian. These four are the big players in this market. These days, they often use a more-or-less standardized design axle that allows 360º steering, hydraulic leveling and hydrostatic propulsion. These are compact units that can be placed side-by-side under a standard-width trailer (2.5 m wide). These were pioneered in the late 1960, with all four companies building various customized transporters for e.g. transporting ship sections using variations of this idea. 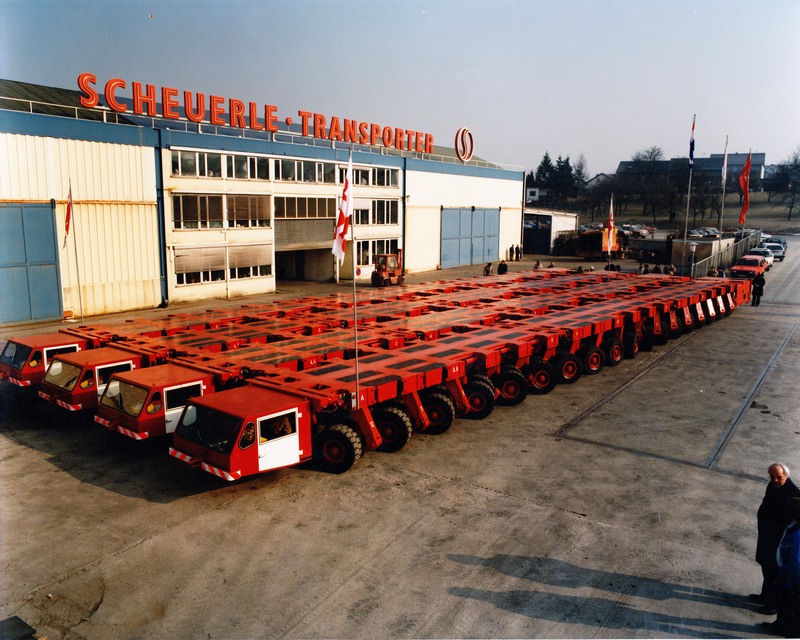 Around 1983 heavy haulage company Stoof in the Netherlands contracted Scheuerle to build a series of self-propelled modular transporters (SPMT) using this design. This was a radical departure from traditional heavy haulage, which used passive (no steering, propulsion or suspension) dollies. The steering makes the SPMT maneuverable, the leveling helps stability and the hydrostatic propulsion means you no longer have to rely on a few tractors to move the entire rig - with only a few driven axles, that ran into limitations. You just attach a power pack to the SPMT and you can drive all the wheels in the combination. The SPMT (as seen on the Kamag used by SpaceX for on-road transports) can be linked up in pretty much any configuration, capable of moving thousands of tons. It's all part of my effort to create highly detailed models of all Launch Complex 39 facilities and transporters. Sigh. Getting great photo reference is the Holy Grail for stuff like that. Very true. I'm very grateful to the L2 section as it has provided some very useful references. So for me it's a mix of L2/public references.